Last week, I wrote about the need for setting up a proper helm. It makes no sense when builders install system instrumentation at the helm that would be better used for marine navigation and other electronics. 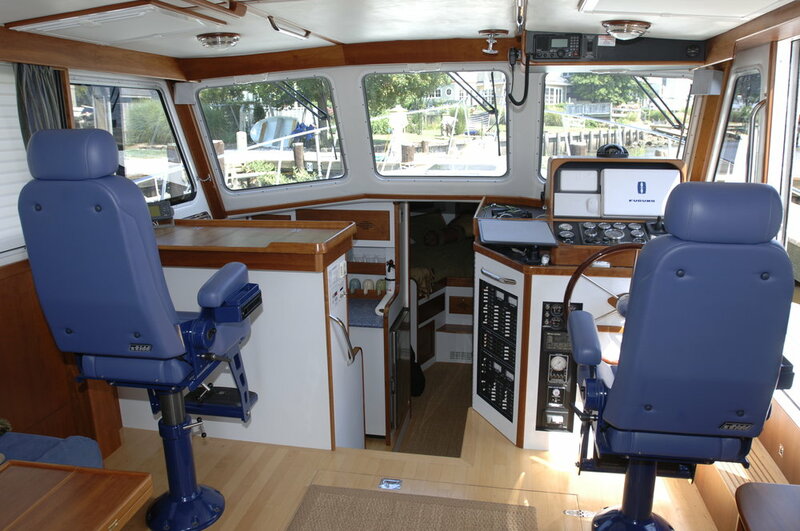 World cruiser Brian Calvert opened up a discussion in the comments under the post about how he prefers bench seating in the pilothouse over what many others consider the gold standard of helm seating, those outstanding and expensive Stidd seats. Walt Gazari designed a fabulous helm seat, and his company provides them worldwide for pleasure, commercial, and military use. Other companies have since jumped on this high-end bandwagon. Spitfire, my PDQ 41 power catamaran, had a Pompanette Platinum helm chair on the flybridge. It was super expensive as well and I found it exceedingly comfortable, especially on long days underway. One fall I ran Spitfire down the ICW by myself from Annapolis to Florida. I spent many hours on the flybridge in that chair. That was a grand adventure. The helm chair on this Nordic 42 is from Llebroc Industries. Thinking over the comments of Brian and others, I thought I would expand on this subject. It is important and also a pet peeve of mine. Many builders don't get how important seating is. This Selene 48 doesn't have the room in the pilothouse for a dedicated helm chair, but the settee is comfortable and close to the controls. The way Brian likes it. Brian is correct in his observation that if you are underway and crew spend time together in the pilothouse or flybridge, a helm seat, such as a Stidd, is not particularly suited to engage in conversation when others sit behind the person at the helm. Brian finds a bench seat better for socializing, as the boat is on autopilot anyway. As long as the bench seat or settee is high enough, one can stand watch just fine a few feet away from the controls. So I agree with him on that. When we travel on our friend's Fleming 55, I usually stand next to him in his Stidd so we can make eye contact during conversation. I take an occasional break and sit at the settee behind him, but we are in the habit of making eye contact when discussing navigation choices or the meaning of life. The pilothouse on the stately Fleming 55. Another friend has a Selene trawler with flybridge. He drives the boat from his helm seat on the flybridge, and I often sit on the flat space for charts on the port side of the flybridge console, so we can talk as we run along. If I sat on the settee behind him, we couldn't easily hear each other. On Growler, our Zimmerman 36, we had matching Stidd chairs next to each other, one at the helm and one at the chart table. That was perfect for two people when cruising. Growler's twin Stidd seats were adjustable in height, and easily turned around to become saloon seating. Great setup. In rough weather and heavy seas, sitting in a dedicated, quality helm chair is best because it keeps you captive as the boat runs along, rocking and rolling. One stays alert and situationally aware. Even if the boat is stabilized, when a motorboat continues into lumpy head seas hour after hour, it is tiring to brace oneself and hold white knuckled on the table in front of a bench seat or settee. It's even worse standing at the wheel. Crossing the Gulf of Maine in a storm while standing watch at the helm was no fun at all. On some boat trips I've been on, the only comfortable place to be was in that helm seat! Hand steering a large trawler offshore during a gale with a broken autopilot was only tolerable because I was firmly planted in a Stidd seat, properly adjusted so I could steer the boat. Production boats used to have built-in helm seating, or cheap aluminum seats that quickly pitted from corrosion, and they were usually far from ideal and not adjustable for different people. Flat and squared off built-in seats rely on cushions for any degree of comfort and can be tiring after awhile. In fact, I recall Bob Livingston, president of Grand Banks Yachts, once joked to me that Grand Banks made the highest quality seating of any trawler yacht...and the most uncomfortable. That all changed when they developed the Aleutian line. Today Grand Banks is on the Stidd program. A Grand Bank helm seat on a 42 Classic. It seems that from the design board, helm seating was not a priority, which explains why I think the most-often heard word in pilothouses with dedicated helm seats shoehorned in is "Excuse me." There is just not enough room to move easily (aka, squeeze) past the chair once someone has adjusted the fore-and-aft seating position comfortably away from the wheel. Unless you are downright skinny, it is just too tight. As I commented last week in the discussion following my last Monday Minute, I am most often part of a short-handed crew, and I typically stand watches with company during the day. So I understand and agree with Brian's comment, but on night watches I am alone, and I prefer the solid and secure Stidd-type seat. Even then, I frequently get out of the chair and walk around to look behind the boat and even peer out the pilothouse doors. My night watches are active watches as I do not sit idle. It keeps me focused, and I take my responsibility for the safety of the crew and boat seriously. I was never one for earphones and a book at night. A Nordhavn set up for passagemaking. The Stidd seats were a very tight fit, but allowed two people to sit together with a settee and table behind. So the ergonomics of helm seating remain varied with opinions and preferences, and every boat has its compromises. However, in my opinion, Zimmerman Marine nailed it with the Zimmerman 36. When it comes to helm seating, especially for a couple, it just doesn't get any better than side-by-side Stidd seats. Newer PostWhat is Life Beyond Boating?